Like a bruschetta topping without the bread. Chop tomatoes into cm square pieces. Peel and chop cucumber into chunks a little smaller than an inch (chop into 4 strips lengthwise and then into chunks). Mince herbs. Mince garlic and parsley very fine. Add altogether with balsamic reduction, olive oil and spices. Tasty and healthy pumpkin soup with a nice edge from the curry powder. A perfect dish for lovers of blackbeans and rice. 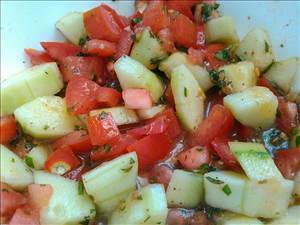 There are 139 calories in 1 serving of Tomato & Cucumber Italian Salad. Calorie break-down: 53% fat, 37% carbs, 9% protein.